The talk was of matters musical, social and political when Bob Marley suddenly leaned forward, to emphasize a point. "The most important thing is to keep the physical together," he said earnestly. "Trees live for thousands of years, you know? But man—man is supposed to live longer than anything else, so man must reach the time when he knows how to take care of this!" Then he laughed, slapping his thigh in his frayed jeans. At that moment, whatever was to come, Bob was feeling irie. Jamaican patois for a blissed-out mellow mood, it was a local word he loved. He enjoyed harmonizing irie on the first cut of "Kaya," the Wailer's 1971 ballad to weed, together with the other original members, Peter and Bunny. Years later, onstage, he still relished stretching out its vowels like molasses over a pulsing Wailers jam. Maybe Bob was concerned by my London pallor, but he was encouraging me to uplift my livity—my wholeness and wellbeing, spiritual, mental and physical. Yet livity also has a more cosmic connotation. Somehow, it stretches beyond our earthly health to suggest both how and why one is alive, how deftly one plays life’s game. Rasta culture is rich in cosmic wordplay. Within livity lies a suggestion of generations of livitys, each a pit stop in an entity’s reincarnations—a belief shared by Rastas, Buddhists and more. So maybe more than "lifestyle," the glossy 1980s word it suggests, livity might imply a life cycle – and not the wheely kind. The year we spoke was 1976 and Bob had been telling me about the preparations for a free concert for the people, called "Smile Jamaica." Elections were approaching and the downtown body count in political gang wars was already high. The Jamaican musician’s career, however, was riding high, as the Rastaman Vibration LP, released earlier in the year, had been the first time he reached the U.S. charts in fourteen years of recording. Bob was readying himself for another leap forward: more global touring, and more using music against the downpressors’ social structure that he called Babylon, which translates into any oppressive top-down system. A farmer as well as an artist, Bob knew the movements of the pop charts, just as he understood the less fickle growth cycle of plants. And ganja was one he knew well. Friends said he sensed the attack coming—Marley enjoyed a rich prophetic dream life. But even when danger was not clearly imminent, Bob always maintained a pro-active "militant" mindset. He liked to live in the spirit of a Jah Army boot camp, constantly in training for the on-going social and political struggles. A true footballer, his approach was strategic: he tackled Babylon on various fronts, and not only creatively. Internally, he deployed physical activity, nutrition, and spirituality. Crucial for his mental health, Bob’s Rasta beliefs kept him level. Wherever he was, he studied the Bible every day and tried to attend meetings of his Rasta community, the Twelve Tribes. When he moved from the peaceful hills of Nine Miles in the parish of St. Ann’s, to the downtown ghetto of Trenchtown in his early teens, Bob was glad to still be surrounded by the trees he loved. Trenchtown locals enjoyed an array of gourmet drinks you can’t buy in the swankiest health food stores: ackee leaf, soursop, naseberry, June plum. Ganja leaf tea is an old country remedy for baby ailments. There’s no record of whether Bob’s late mother Cedella Senior gave it to baby Bob, but she knew her medicinal plants. Wherever she lived, Cedella would immediately start planting her own vegetable and herb garden. Bob himself was well aware of the virtues of juicing before it was hip. One memorable meal I shared with the Wailers happened in a hotel suite in Germany after a glorious concert on the "Exodus" tour in 1978. A pride of young Dread lions always gathered around Bob wherever he went. His core team included a strapping, athletic youth named Tony "Gilly" Gilbert, whose role at home and abroad was Ital chef, minder and trainer. It was Gilly’s touring challenge to whip ‘round strange markets while the band was at soundcheck, and source top ingredients for one of these occasional post-show feasts. Taking pride of place was the juice. Blenders were always whirring where the Wailers stayed, and that night’s dense, rich Irish Moss—a linseed-based seaweed drink—was outstanding. Beyond the juice, the spread was glorious down home yard-style: moist, thyme-studded rice and peas, vinegar-y escovitch fish with its fiery pepper sauce, jerk or stew chicken for the carnivores, ground provisions like yams and sweet potatoes and cabbage sliced so fine and stewed so long that it sweated sweetness. Gilly must have pounded those German pavements to please the Wailers family with a real taste of home, an Ital meal. In keeping with many belief systems like Judaism’s kashrut, Muslim halal, and the Hindu concept of Ahisma, Rastas observe a dietary code, and as in all faiths, they are observed to individual levels of strictness. The Rasta Ital ideal is a vegetarian diet, one that relies on flavor and skillful use of fresh local ingredients like coconut milk, curry, and the herbs with which Jamaica abounds: garlic, mint, thyme, and Scotch Bonnet pepper; with the challenging exception of salt, an Ital no-no. As soul foods do, Ital dining creates another level of connection among those who share it; an affection you can hear when Bob sings about the humble Ital food in the communal outdoor kitchen of his Trenchtown yard in "No Woman, No Cry": "And Georgie… would cook cornmeal porridge/Of which I’ll share with you." On "Roast Fish and Cornbread," by Bob’s close bred’ren and key producer Lee "Scratch" Perry, you can hear reggae reverence for healing Ital fare. For Bob, football was like Ital food—another good fuel to wake up one’s living essence and help get things done. Football was almost as much a constant as music. On the road, Gilly would be central to the ad hoc matches that were pulled together as often as possible, to boost the Jamaicans’ energy and get a feel for where on earth they were. Bob was a lively player and strong on collaborative passes. Back home in Kingston at Bob’s ample colonial mini-mansion, 56, Hope Road, (now the Bob Marley Museum,) a near-constant game of football played on what would have been the front lawn; a counterpoint to the activity at the recording studio inside the house. Other than the steady stream of industry types and world media, the effect was that of a busy compound or ghetto yard oddly dropped into a plantocracy Great House. Because Prime Minister Manley’s official residence was a few doors down, Hope Road was one of the smartest streets in Kingston. When I inquired about his posh digs on a visit in 1979, Bob retorted that he was, "Bringing the ghetto uptown." Whether at home on Hope Road or on tour, Gilly would often co-ordinate the daily program. "Bob would get up early, then we would exercise. We were soccer players in the club league, and Bob was a hard worker. He would train to have that breath control," Gilly remembered tenderly when I interviewed him in 2005. "We would go to the beach in Bull Bay and run along the hard sand, then run a seven-mile journey up continuous hills to the Cane River, go under the waterfalls, and get rejuvenated. Then we’d go back to the beach and have roast fish with the Dreads, go back to Hope Road, and Bob would write songs on his guitar." It’s an idyll Ital roots livity that many of us dream of—and you can be sure that the Wailers crew and the fishermen shared seafood and "brain food" (as another bred’ren of Bob’s, the mastersinger Dennis Brown, liked to call "ganja"). 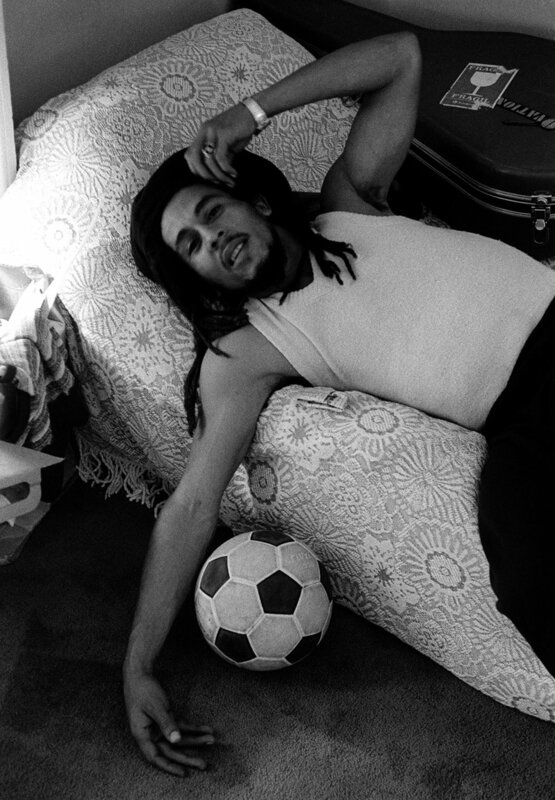 Although his home had a bad reputation for violence, Bob appreciated the restorative power of Jamaica itself, the lush island that the original Tainos called Xaymaca, the land of wood and water. A certain dreamy look of contentment lit up Bob’s face on the rare occasions he allowed himself to flash back to his rural beginnings; his mind was so often focused on the future. The importance of human contact, courtesy, and community (even more necessary now, in these times of real and virtual alienation,) also clearly held value for Bob. "If you come to Jamaica and want to see something, you can’t really see nothing down King Street and Jones Town," Bob declared expansively to me one day, referring to both a central Kingston business street and a community near Trenchtown. "It is not really that you come for. You come for some big rock and nice river and some trees and good herb. And country people (who) live up so. Dem woulda never pass you in the street and don’t say, ‘Good morning, God bless you.’ So them stay." When he fondly sang, "Throw me corn…." and mimics clucking hens on "Who The Cap Fits," Bob brought his St. Anne’s Bay roots into the studio. "I come from country," he emphasized to me in 1977, "and country is always nice." Even then, he seemed to miss feeding the hens, a favorite childhood chore. You can reference Thoreau, who exclaims in Walden, "I went to the woods because I wished to live deliberately," or Burning Spear, Bob’s old bred’ren, chanting, "It is good for a man to live in the hills." If you can make it to Jamaica, and for those lucky locals who can escape Kingston’s broiling bowl and ascend into the cool Blue Mountains that ring it, the Rasta natural livity can still be found. Bred’ren and sistr’en alike love the secret places that only locals know, way up in the mountains, where the sources of Jamaica’s great rivers are found. You can still pick your way over steep rock stones, as Bob and Rita both often did, and feel the waterfall pound release into your city-stiff shoulders. The sustenance of a happy country childhood fortified Bob, always a country youth at heart. One of his cherished retreats was Strawberry Hill, set high in the towering Blue Mountains. Now a bijou boutique hotel, back then it was a Great House as it had been since the 18th century. Bob loved to escape up there, to a little wooden shack kept for hikers and the like, with two dormitory-style iron beds. There, high above the everyday pressures, he could sit at the edge of what’s now called The Great Lawn and watch the clouds form arabesques in the sky, his meditation freely wreathed in fragrant herb vapors. That ideal everyday rhythm of Rasta livity, as simple as it theoretically seems, is of course a luxury beyond most of our reach. But when we think of Bob and his quest for his highest functionality, it is important to know we can develop some equivalent process in our own lives. Wherever we are, we can try to balance work and physical activity, creativity and contemplation, and fortify ourselves nutritionally. Raised among rolling hills, some part of Bob was always ready to return to the nurturing land. When things were slow with the Wailers and their own indie label Wail’n Soul’m, Bob, Rita and the kids moved home in 1967 and began working his grandfather Omeriah’s property. A farmer as well as an artist, Bob knew the movements of the pop charts, just as he understood the less fickle growth cycle of plants. And ganja was one he knew well. Bob smoked constantly, maybe even as much as he made music, or prayed. He believed in treating ganja with respect and was unimpressed by time-wasters using the plant "just to get high." To Bob, ganja was a tool for meditation, creation and action—and a crop to be planted and harvested. "(Some people feel like) your brain is smart, and you’re alright. But sometimes you really need herb to smoke, so that you can think out all the things we can think. Teachers are generous, because they teach you. But herb gets all your teachings together and explains them to you and makes you realize what the teaching is all about."